My parents’ beautiful lake house kitchen is complete, and today I’m so excited to give you a photo and a video tour of the space! 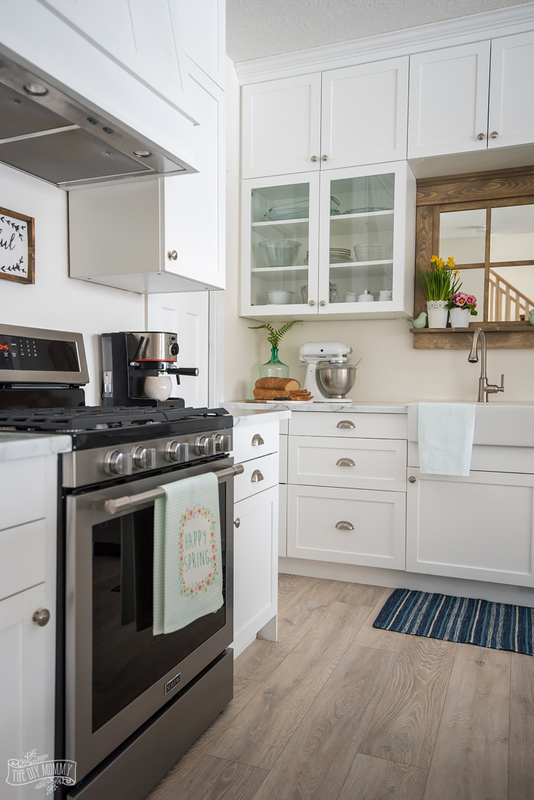 With help from Maytag, The Brick, and a whole lot of DIY, this kitchen is both practical and gorgeous on a budget. Let me share with you Mom’s Lake House kitchen! Just after Christmas, I showed you the progress of this classic cottage styled kitchen. It was almost done minus a couple of finishing touches and the addition of a big, beautiful island in the center. I’ll talk about the DIY additions shortly, but first my parents and I wanted to share what they’ve thought about their Maytag appliances from The Brick after using them for a few months. This Maytag Gas Range has been a dream to cook and bake with – and my mom & dad cook and bake a lot! The fresh, whole wheat bread you see on the counter above was cooked with this oven, and Mom says it’s the best bread she’s ever made. This is my parents’ first gas range, and they really enjoy cooking on it. Mom was initially worried about how it would cook more delicate items like cream sauces, but it did not disappoint! My dad likes it so much, that he’s been asking to cook more and my mom doesn’t mind that at all. Their Maytag Refrigerator is a great size and really handy. My mom loves the clean, industrial look of the handles on the fridge and the rest of the appliances. They look fabulous in their cottage kitchen! The Maytag dishwasher has also been working really well for my parents. My mom likes the fact that she can fit all her pots in it and that is has a really nice cutlery tray that’s easy to unload. It also holds a ton of dishes which is perfect for all of my parents’ big gatherings! 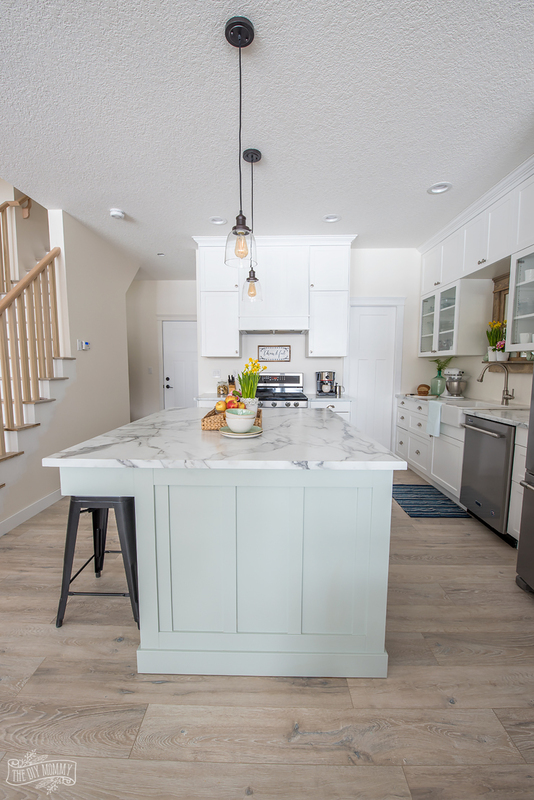 Now, let’s talk about the big addition to this kitchen – the beautiful custom island! 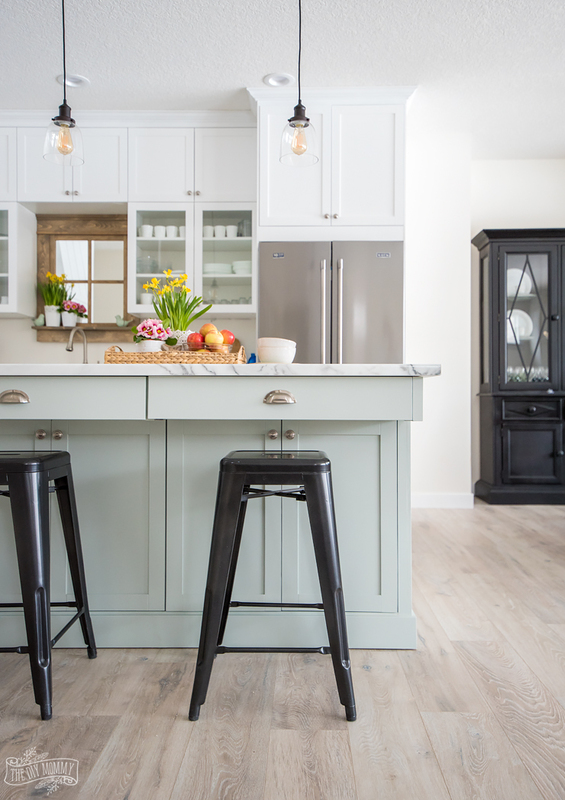 I really love the paint colour that my mom chose for the island – it’s a soft grey-mint called Comfort Gray by Sherwin Williams, and it adds so much function to the kitchen. 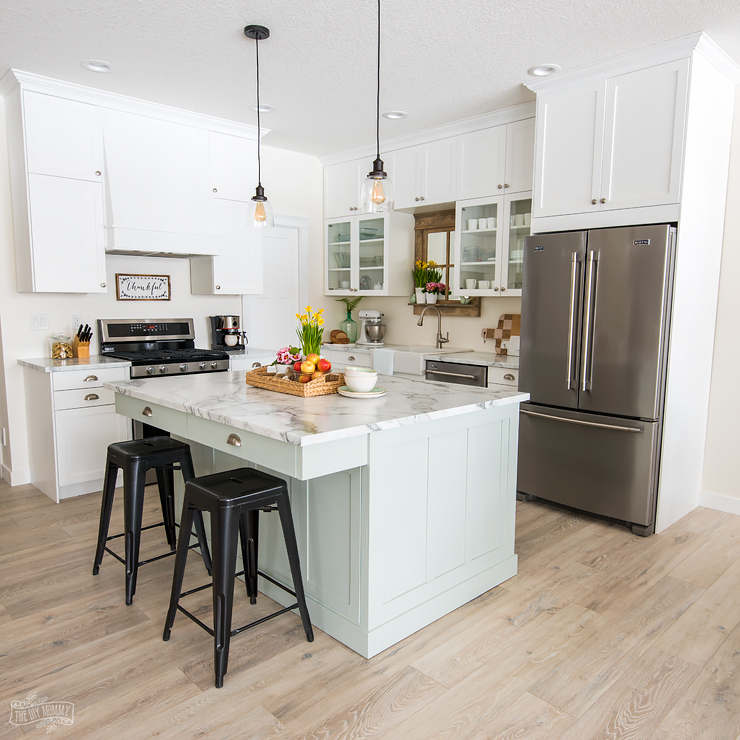 They used pre-built cabinets to create the island base, and then added custom trim to the bottom and ends for a lake house look. 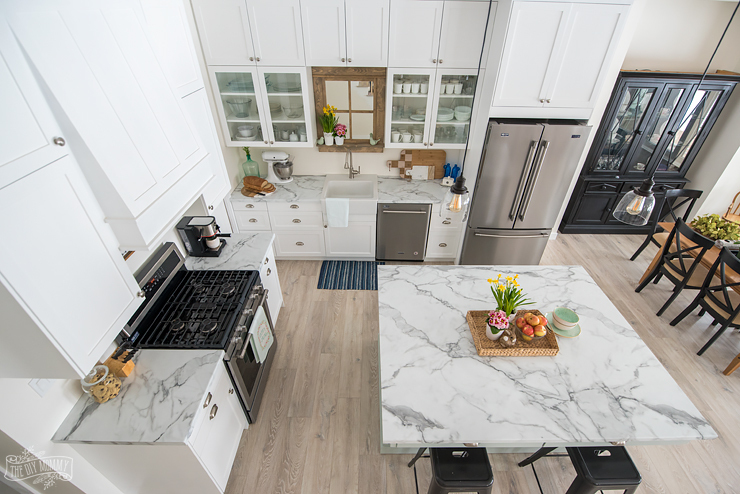 The countertops are a marble look laminate from a local countertop manufacturer. They even built custom doors and drawers on this end with the stools for added function. It’s a very large island that’s going to be a great work space and serving space! I like how The Brick’s Pinnadel Stools add just a little bit of black to tie into the pretty pendant lights that my mom chose for over the island. 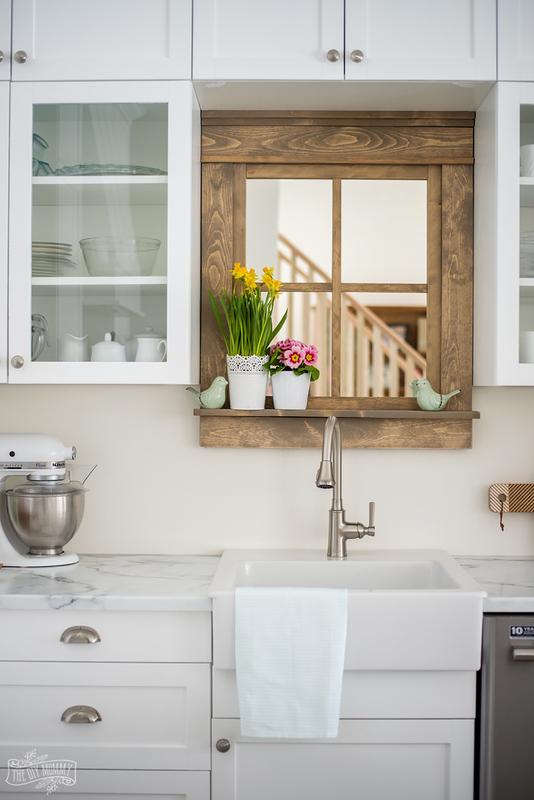 Another stunning addition to this kitchen is this vintage style farmhouse window mirror that my mom made. 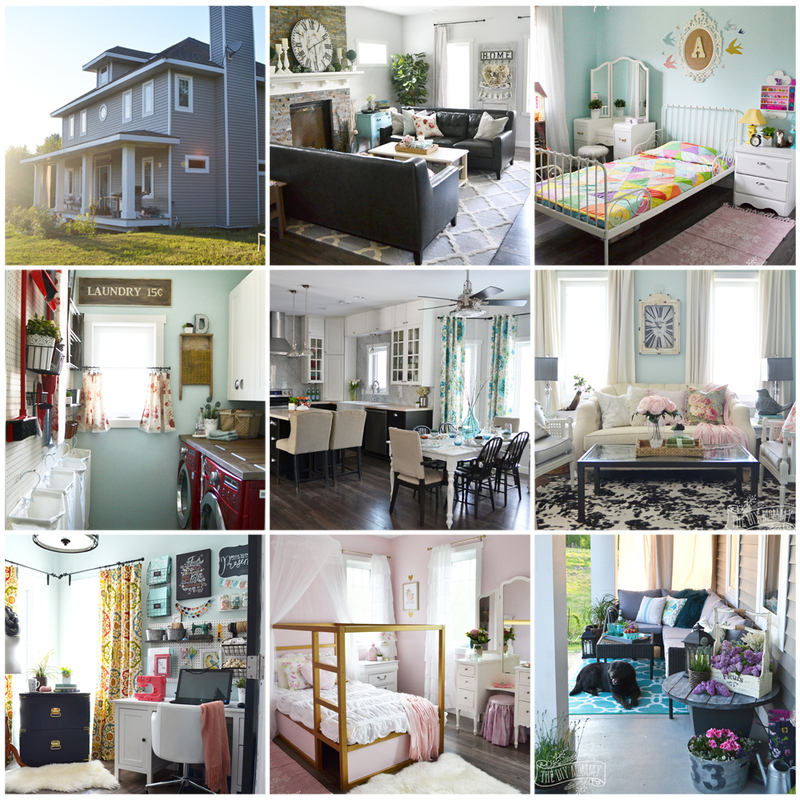 The inspiration for it was the window trim at Mom’s Oma’s house overlooking the river. My mom bought rough fir and tried to model the trim of this mirror after some bookcases she salvaged from the home. 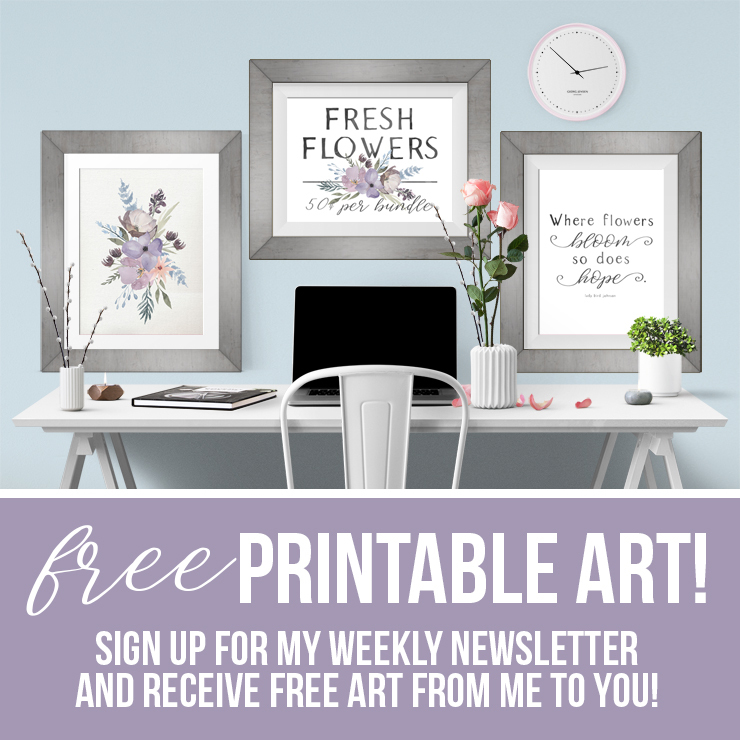 Isn’t it a beautiful DIY?! 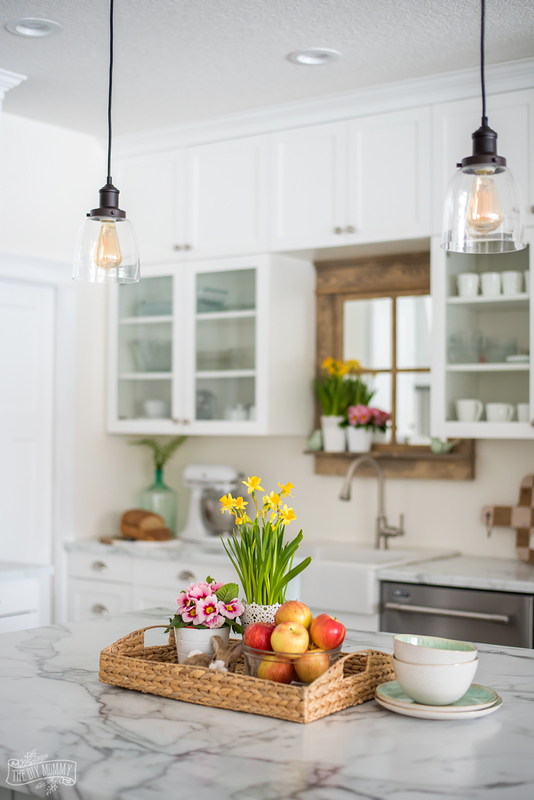 It was such a treat to style this kitchen for Spring – the mix of white, mint green and warm wood tones really lends itself to Spring celebrations, and the addition of some fresh flowers, fruit, and white & mint dinnerware made it look ready for the season. I can’t wait to make tons of new memories here in the kitchen at Mom’s Lake House. It’s the perfect space to spend time with the people I love the most! 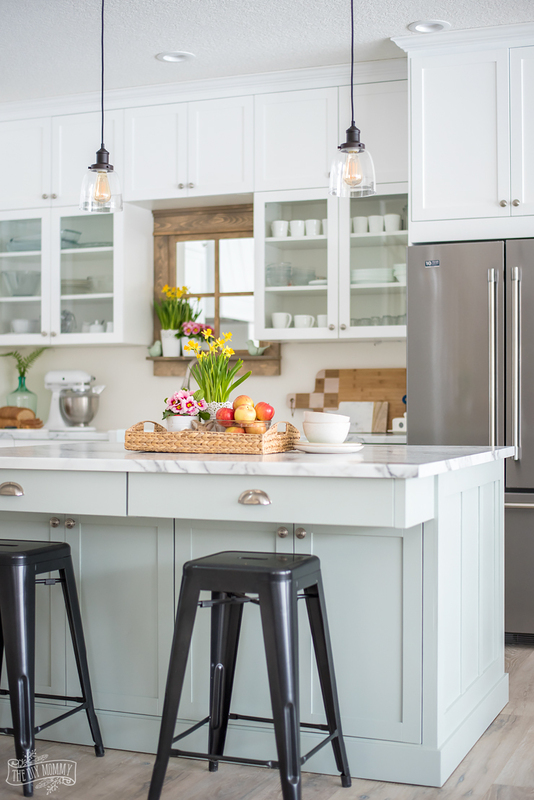 Tell me: What do you think of this bright lake house kitchen design on a budget? What an absolute dream! 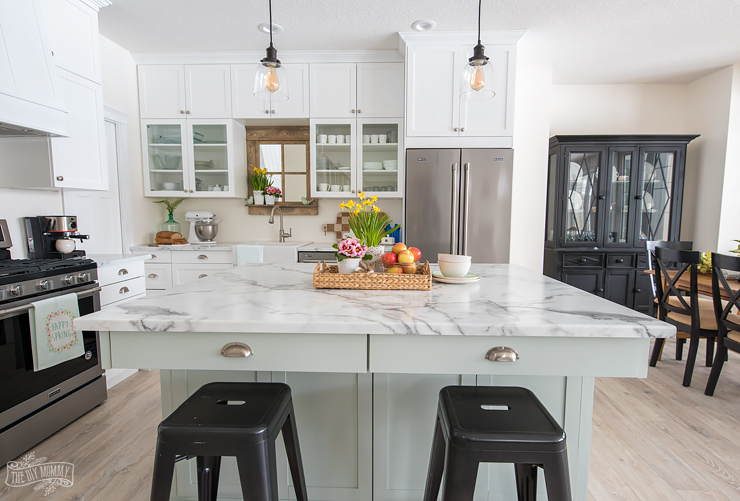 I LOVE the island design, especially those drawers over the stools and what a perfectly subtle pop of colour! 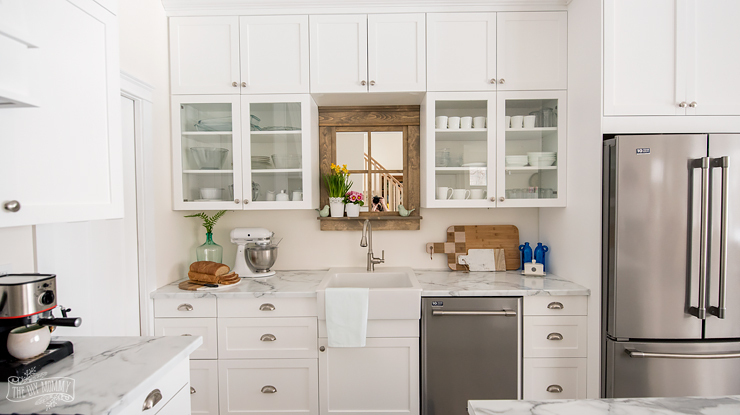 And I’ve already mentioned how head-over-heels in love I am with that sweet little window mirror over the sink! Everything looks absolutely perfect!!! I love the kitchen it is a dream kitchen, I did not realize you can get a farmhouse sink to go with a laminate counter top, I will have to search that out. If you need a diy project for a kitchen counter top, I just did ours using the counter top refinishing kit you can get from Home hardware stores. It turned out good, but it does need 3 days to complete and 7 days to completely harden but the expense was only 149.00 so very budget friendly. What a great tip Deborah! We will definitely keep in mind for future projects. Pretty! Would share the name and brand of the wall color? Morning Christina, Can you please tell me about the flooring? What is the product and the colour, please? Thanks. The Flooring is Oak Concerto Laminate Flooring. Have a great rest of your day! Christina this is absolutely gorgeous! 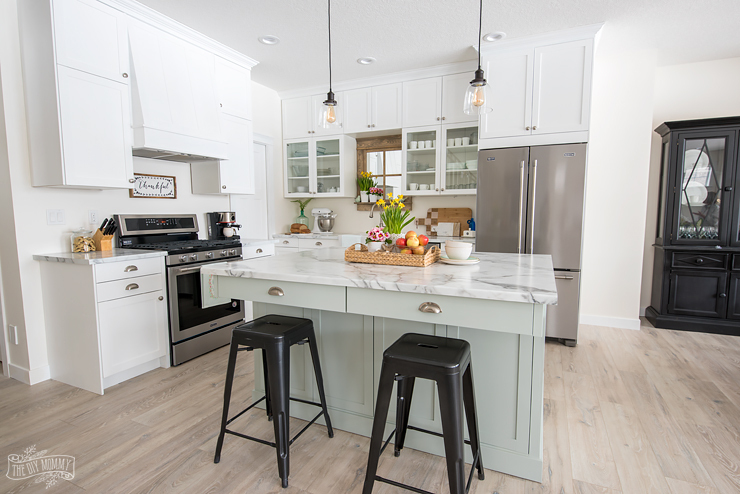 Those floors and the counter tops literally have me drooling over here! I cannot wait until we are able to tackle our kitchen. Absolutely gorgeous kitchen! 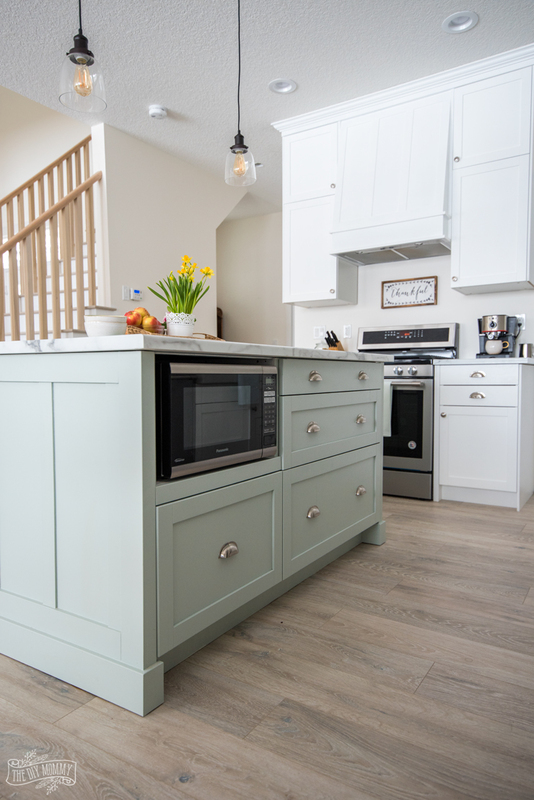 I agree with you about the island, the colour is beautiful and really adds to the kitchen. Also love the sink and the countertops. 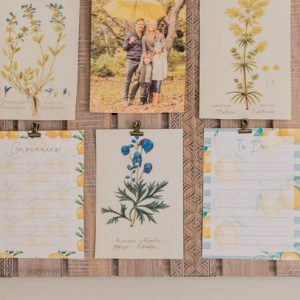 Could you tell us what laminate your parents used? I want to do the same thing in my kitchen. Thanks, Christina. Your video was a lovely piece of eye candy for a Sunday afternoon! By the way I really love your new teal loveseat from The Brick. This is stunning! 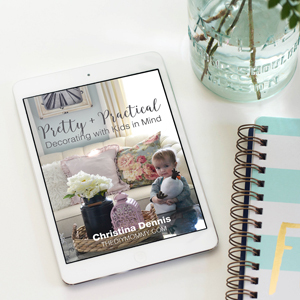 I think my favorite part is her DIY mirror. 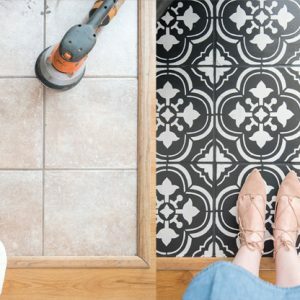 What are those beautiful floors? Beautiful kitchen! Thank you for sharing 😊 Can you give more information on the countertops? Thank you!